On our recent trip to Hawaii I purchased a new 4 terabyte portable hard drive. As I'm off to Rootstech in four days and shortly after that I'll be off gallivanting with Mr GeniAus I thought it time to copy all the files from my existing portable drive to the new one. I'll then be able to take one of the drives on my journeys knowing that all my files are backed up safely at home. 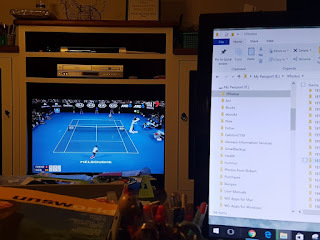 Last night as I watched my hero Roger play in the Australian Open I started transferring my files in manageable chunks. I felt more confident managing this task manually. I have photos from the late 19th century to today all organised in folders by date. At this point in time I am copying over our pics from 2013. Did you know I have 33,000 images from 2012? This process is taking a while. I had previously transferred some of my family history files and will finish this (if and) when the photos are done. Meanwhile I didn't want to do too many tasks on my computer that may slow down the copying process. I had to think of a job for today that didn't involve the keyboard. About six months ago I set up a folding table in my study on to which I sorted some of the hard copy family history files I had scanned. I am kicking myself that I didn't take a picture of this mountain range of filing piles because it has now vanished. Today I have dealt with all the files for myself, Mr GeniAus and our offspring. Next task is to sort the ancestor and grandchildren's papers on to the I may take a photo of the next mountain range of files I build. Meanwhile I am so proud of my pile busting exercise. I know I should be ditching a lot of this paper now that it's digitised but, like most genies, I'm a hoarder.